...in which a post punk diversion signals a turning point for the future J.K. Flesh. Godflesh were one of the most important bands of my teenage years. Starting with Selfless, my appreciation for them has bordered on religious, and I've gone out of my way to track down most of Justin Broadrick's other work. There are things that I've explored only superficially - the ambient/noise project Final, the dub Techno Animal among them - and projects that disappointed me by not living up to their potential (the "fantastic on paper" collaboration with Aaron Turner, Grey Machine). But it took me years to hear Broadrick's work with Head of David. Frankly, I only acquired Dustbowl by luck. Before Youtube made every album ever recorded only a click away, most of my disposable income was spent on used CDs - it was the most cost effective way of filling in gaps in my musical collection. I snagged the album in the same buying spree that netted me Old's final album Formula, and probably from the same impulse - "better to buy it and not want it than to want it and never find it again". Frankly, I didn't know what to expect, except "not much". 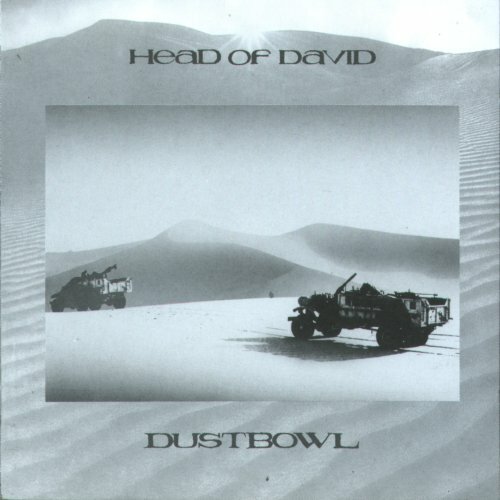 My first exposure to Head of David was through Fear Factory's cover of "Dog Day Sunrise". Colin Richardson's squeaky clean production, along with Burton C. Bell's new wave croon, made the song shamelessly pop and was one of Fear Factory's earliest singles - it might even be considered a minor hit for them. But Head of David's original shows no such ambitions; with its plaintive vocals and droning guitar, it shivers like a junkie in the throes of withdrawal, all cold sweats and fever dreams. As a whole, Dustbowl is radio-unfriendly; in its slow, feedback-happy menace, it's more akin to the teethgrinding noise rock of Unsane. Regardless of the length of his tenure, his time in Head of David seems to have had a lasting effect on him as a songwriter. Dustbowl is built around elements that would become part of his M.O. : Discordant guitar noise, stabbing basslines, and minimal (dare I say "mechanical") beats. Guitars are treated almost as an afterthought - as a way to generate sonic textures, rather than any devotion to "the riff". Add to that the album's hypnotic, almost droning use of repetition, and you can hear the seeds of future Godflesh songs germinating. Putting aside its creators and their respective discographies, Dustbowl is a great album. It ranks among the best post-punk albums I've heard. But its importance lies in its historical context. It may have been for careerist reasons, but joining Head of David freed Broadrick from the "fast, faster, fastest" track that Napalm Death was on and would remain tied to for years, allowing him to create a style that remains very much his own. As a longtime Godflesh fan, it's a fascinating signpost to what may have guided a 17 year old Broadrick down the path he chose - to Streetcleaner and beyond.